SVS Productions are proud to present FTW TKKC. The brothers from FTW TKKC are back in Putaruru bringing their internationally acclaimed, Aotearoa Hard Roots Rock Reggae Music. Sash, Rich, Tommy, Jess and Robbie bring their unique original Rock Reggae music to one of New Zealand's best live music venues, the Putaruru Hotel. 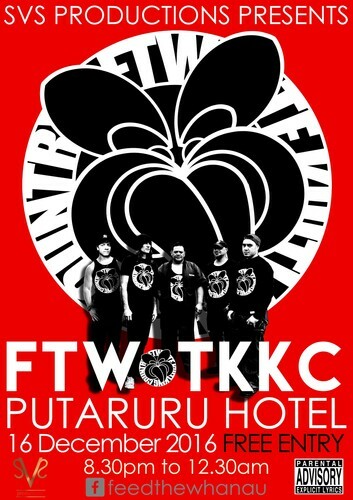 FTW TKKC have created a solid fan base of some of Aotearoa's biggest acts including Katchafire, Herbs, and Kora. Their original music has been featured on TVNZ, Maori Television, Radio NZ, Bfm and much, much more. Have a great night out with friends and dance along to some of the best original music you will hear this summer. "Genius" Mike Nielsen, Producer of U2, Jameriqui, Bjork.